Did you know that with the tax services offered through Joycetaxservices.com consumers can eFile a return and literally cut their tax filing time in half. Paper filing is tedious, monotonous and terribly time consuming. Tax software makes the tax filing process a breeze and many consumers can attest to the fact that online tax preparation takes the anxiety out of tax filing all together! Why waste time shuffling through myriad documents, regulations, and confusing tax papers when you can easily file taxes online. Cut preparation time and filing time down dramatically when you rely on a dependable online tax preparation service like Joycestaxservice.com. Fantastic tax software offered through Joycetaxservices.com takes the drudgery out of tax filing. File your taxes with ease and to get back to the business of making money. Some people may fear the act of relying on an online tax preparation service – how does one know that they are getting a quality service? Actually, online tax filing is becoming more and more the norm. Let us alleviate your fears. Our online tax forms are simple and easy to understand. 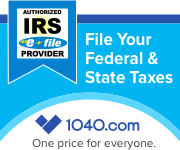 Did you know with the services offered through Joycetaxservice.com that you can actually eFile your taxes and get a refund in ten days? If you have a refund coming to you, there is little doubt that you want it as soon as possible. You can even have your refund directly deposited into your bank account for immediate access when it becomes available. Did you also know that in certain instances if you qualify, you may be eligible for a refund anticipation loan even if you file your taxes using income tax software and you file online? It’s true – many consumers are taking advantage of the simplicity offered through tax software usage and still getting a refund within 24 hours! Joycetaxservice.com offers more than just online tax preparation services: Joycetaxservice.com supplies access to informative material about tax filing. Consumers can educate themselves about general tax information, review the tax calendar, and get access to federal and state tax forms and even access filing addresses at Joycestaxservice.com. Looking for some unique and savvy tax tips – look no further than Joycestaxservice.com, a site that offers online tax preparation and that relies on income tax software is a site that also gives advice about Roth IRAs, education expense reductions, medical taxes, dental taxes, home improvement deductions, and how to solve issues with back taxes owed. Find clear cut ways to lower your tax bill annually, thanks to the information supplied at Joycestaxservice.com. Some consumers choose to forego the assistance of an online tax preparation service and choose to do their taxes by relying on income tax software and preparing taxes themselves. Our online tax preparation software offers federal and state filing packages and the user friendly features make filing taxes a truly simple task. It is user friendly and easy to navigate. You will find it handles all of your tax filing needs online. Life is complicated but filing taxes is no longer a bothersome endeavor: relying on Joycestaxservice.com to prepare your taxes the filing process is completed with ease and efficiency. 8.7 million people successfully filed their taxes online in 2005.
eFile and receive your refund in half the time of filing a paper return. eFile and receive your refund in as little as 10 days if you use direct deposit. eFile and receive your refund in as little as 24 hours if you qualify for a refund anticipation loan. Complete the filing process at your convenience.